What about the Ten Commandments? The incident of Jesus and the rich young man (or ‘ruler’ in one version) poses some questions worth discussing. The man in question asks Jesus what he must do to receive eternal life. Jesus goes on to quote five of the “Ten Commandments” that Moses received on Mount Sinai. 1 “You shall have no other gods before me. 2 “You shall not make for yourself a graven image, or any likeness of anything that is in heaven above, or that is in the earth beneath, or that is in the water under the earth; you shall not bow down to them or serve them…. 3 “You shall not take the name of the Lord your God in vain…. 4 “Remember the sabbath day, to keep it holy. Six days you shall labor, and do all your work; but the seventh day is a sabbath to the Lord your God; in it you shall not do any work…. 5 “Honor your father and your mother…. 6 “You shall not kill. In responding to the young man (Matthew 19:16-19), Jesus quotes the 6-9th commandments, then the 5th commandment, and then caps it off with “you shall love your neighbor as yourself,” which is not one of the ten “words” (commandments) given to Moses. Where did that come from? In Matthew 22 we read: A lawyer, asked him a question, to test him. “Teacher, which is the great commandment in the law?” And he said to him, “You shall love the Lord your God with all your heart, and with all your soul, and with all your mind. This is the great and first commandment. And a second is like it, You shall love your neighbor as yourself. 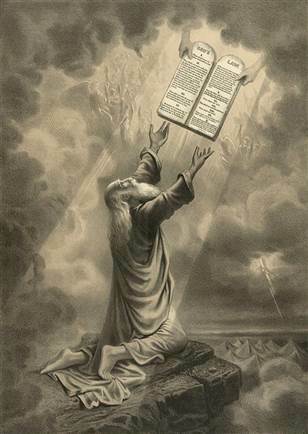 On these two commandments depend all the law and the prophets.” And here too, Jesus quoted two passages from the Books of Moses and combined them together as the sum of everything the Bible commands! Here is what I find most interesting about the dialogue with the young man. In quoting the Ten commandments, Jesus completely ignored the first four commandments which have to do with our obligations toward God and only quoted commandments that have to do with how we relate to other people! And to cap it all off, Jesus concluded with “you shall love your neighbor as yourself” – but here too he ignored the first of the two commandments that sum up all the law and the prophets: “you shall love the Lord your God”. So Jesus’ answer is completely about the man’s relationship to the neighbor! He leaves God out of the equation. The man claims he’s okay with all those commandments, but Jesus knows better. So he throws the challenge to him: If you want to be perfect…. The young man goes away disappointed. And Jesus speaks those terrible words about how difficult it is for a rich person to enter the kingdom of God. But is it then easier for the poor to enter heaven? Many, including myself, have often drawn that conclusion. It’s also a standard tenet of liberation theology. But perhaps it’s good to remember Dostoyevsky’s parable of the old woman and the onion that I shared in my previous post as a corrective to that simplistic idea. Really, if you look at the actual commandments Jesus used in his response to the man, you see that money is not really the issue, but how we relate to each other. There is no point in talking about love of God if we don’t first talk about love of the neighbor. As John wrote in his first epistle: If any one says, “I love God,” and hates his brother (=neighbor), he is a liar; for he who does not love his brother (=neighbor) whom he has seen, cannot love God whom he has not seen (1 John 4:20). Our sins go beyond money. Our sins are always against the neighbor. But let’s go back to the so-called Ten Commandments. The Book of Exodus refers to them as “words” rather than commandments; but commandments they are for our purposes. For many years now there have been constant and relentless efforts by right-wing fundamentalist Christians to have the Ten Commandments placed in public buildings, especially courthouses. The discredited extremist Roy Moore was one of the biggest promoters of that campaign. I can still remember writing a letter to the editor of our local newspaper many years ago in opposition to the efforts by Moore and others like him to display the Ten Commandments in public buildings and courthouses. I’m against all such efforts even more strongly today, as we face the relentless war for “religious freedom” being waged by the Christian Right against all other religions and anything that stands in their efforts to impose a theocracy on American society. Religious freedom for them means freedom only for their religion! The second commandment is about images and idolatry. This is a touchy one for us Orthodox who have images in all our churches and in our homes. We of course deny the allegation that we are breaking the Second Commandments, but the allegations are regularly made against us by Protestant fundamentalists and Evangelicals – in other words, by the same crowd that wants to impose the Ten Commandments. I wonder how much “religious freedom” we Orthodox would have in a right-wing theocracy. And let’s carry the argument further. What is an idol anyway? When these same Christians who oppose icons and images begin their church services with the Pledge of Allegiance, are they not treating the American flag with the same respect and devotion that we Orthodox show to our icons? I’m not against the Pledge or the flag, they are part of American civil life. And if some Christians want to begin their worship services with the pledge to the flag, that is their business and their freedom to do so. But let’s not allow them to impose their narrow understanding of images and idolatry on the rest of us. So the Second Commandments is problematic in a pluralist society such as ours. What about the Third Commandment? Oh my God, what a farce we have made of that – we “Christians” first of all, as I just did in the way I opened this sentence and the way most of us open countless sentences and exclamations. Or the way we toss out “Jesus Christ” as a swear word. We Christians treat the names of God with no respect or mindfulness; so what right do we have to impose respect for the name of God on others who do not recognize the validity of the Ten Commandments? 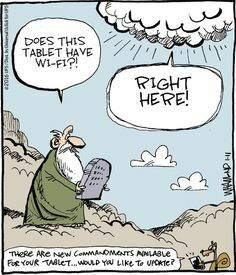 And finally there is the Fourth Commandment, the wonderful Fourth Commandment, loaded with such beautiful theology, even more important in our our ecologically disastrous age than it was in Moses’ time. When is the last time any of us honored the sabbath? When is the last time Roy Moore honored the sabbath? Or any of his right-wing fundamentalist cohorts? But isn’t Sunday now the sabbath for Christians? Yes, the new Moses of Byzantium changed the sabbath to Sunday. Okay, so when is the last time you honored Sunday by not working, by not going to the Mall, by not taking your child, grandchild or niece to hockey practice, or soccer practice? Need I go on? Do you see how hypocritical we are when we talk about the Ten Commandments? And how obscene are the efforts by a large segment of right-wing Christians to impose the Ten Commandments on our society? These same right-wing Christians constantly raise alarms about Moslems, that they are intent on imposing Sharia law on us. But they don’t see their own efforts at theocracy as the more immediate and more plausible evil. The Ten Commandments themselves have become an idol in the hands of many Christians, so it is refreshing to consider how creatively Jesus used the Ten Commandments in his dialogue with the rich young man. Perhaps I can be excused for concluding with a couple of cartoons as a small act of deflating the idolatry. A different version of the above, without the extended reflections on the Ten Commandments, was given as a sermon on August 19th. Categories: Biblical Explorations | Tags: Christian theocracy, Jesus and the rich young man, religious freedom, right-wing Christians, Roy Moore | Permalink.